Chain | Cal Fasteners, Inc.
Cal-Fasteners carries many types of Chain and Chain Accessories. 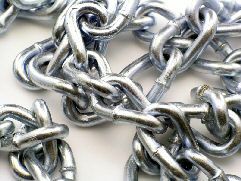 Chain products are used in several applications, such as towing vehicles, binding loads, stump removal and crowd control to name a few. Along with the different kinds of chain are accessories used with and without the chain. We stock Eye Bolts, S-Hooks, pulleys, turnbuckles and many other related items. These come in many materials like steel (several grades depending on application), stainless (304 and 316), brass, nylon and even plastic. Whatever your need may be send us your inquiry today. Passing Link Chain-Bright zinc finish.